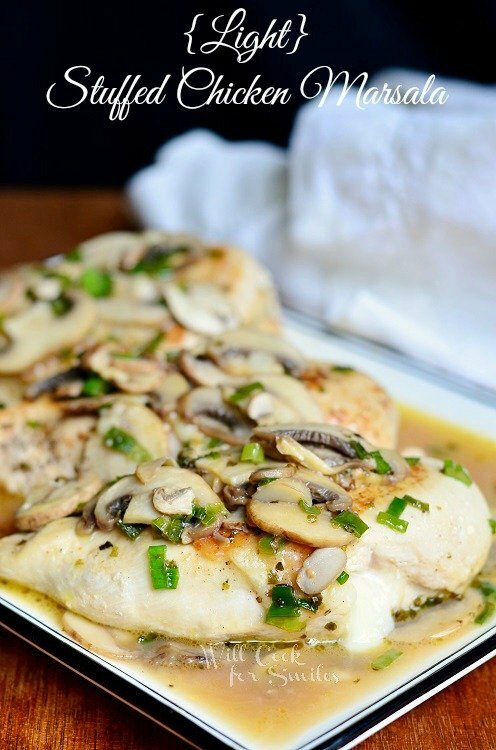 Perfect weeknight dinner that will definitely satisfy even the pickiest family members. 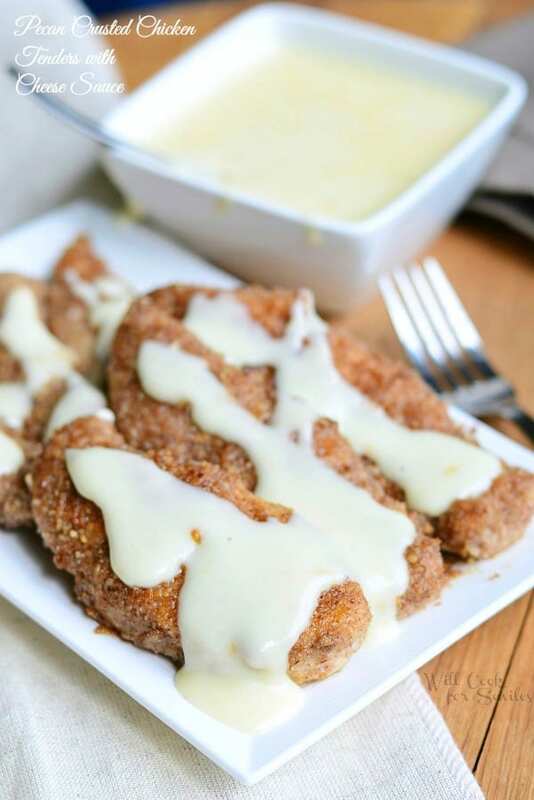 Amazing chicken tenders crusted with pecan crumbs, cooked to a crispy perfection and topped with smooth cheese sauce! Have you been trying to find new dinner ideas to serve because you’re tired of eating the same thing that your picky kids agree to eat? I believe I can help! I don’t know many kids that don’t like chicken tenders. It’s actually the only things my picky little man will eat when we go out. Good thing we don’t go out to eat too often because it is literally the only thing he will eat at a restaurant. I’m happy that he will eat a bigger variety of foods at home. Plus, homemade chicken tenders are just so much better! 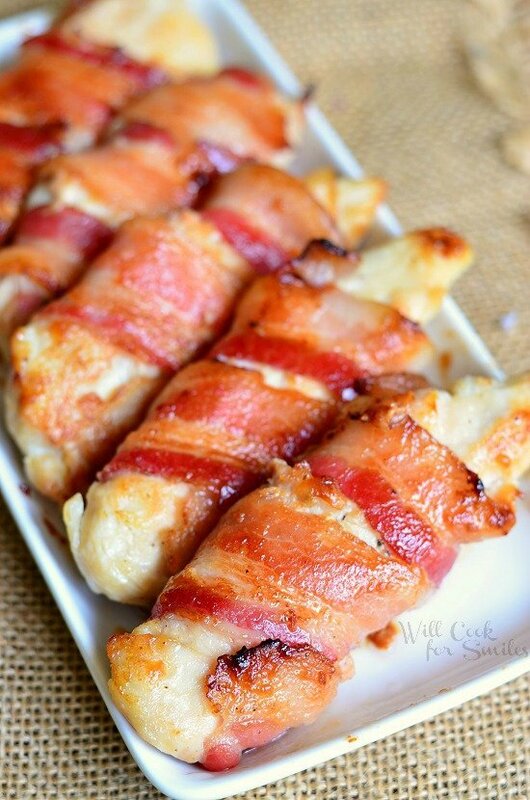 For one, you don’t have to fry them (big plus for me), you can sear, pan-fry or bake them. Plus, you can come up with some creative ways to flavor the breading. 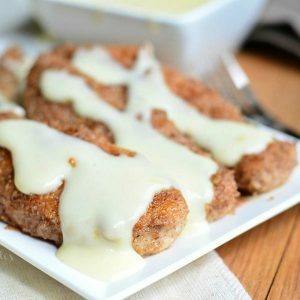 These Pecan Crusted Chicken Tenders with Cheese Sauce will be perfect for all ages (yes, especially adults)! First, you have the cheese sauce, which means that it’s pretty much a guarantee your kids will eat them. With cheese sauce, most kids will even agree to eat steamed broccoli. 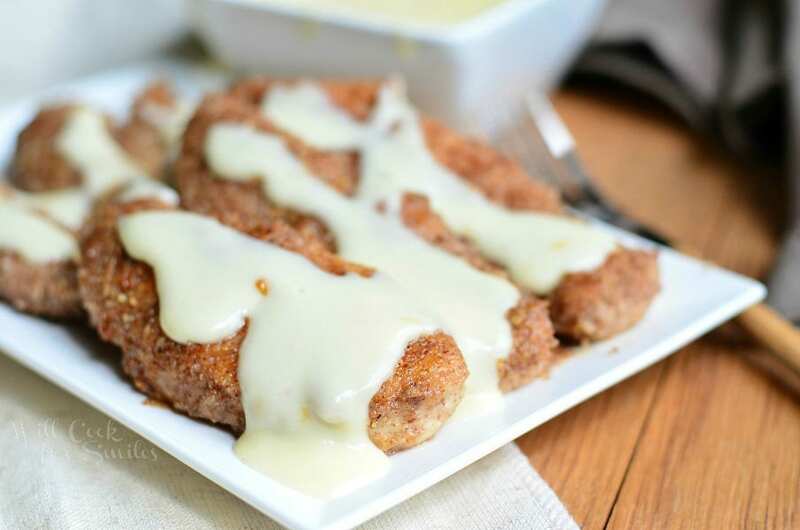 Pecan breading also adds that special flavor touch that adults and older kids will appreciate while younger kids will probably not even question…hello, there is cheese sauce on top! 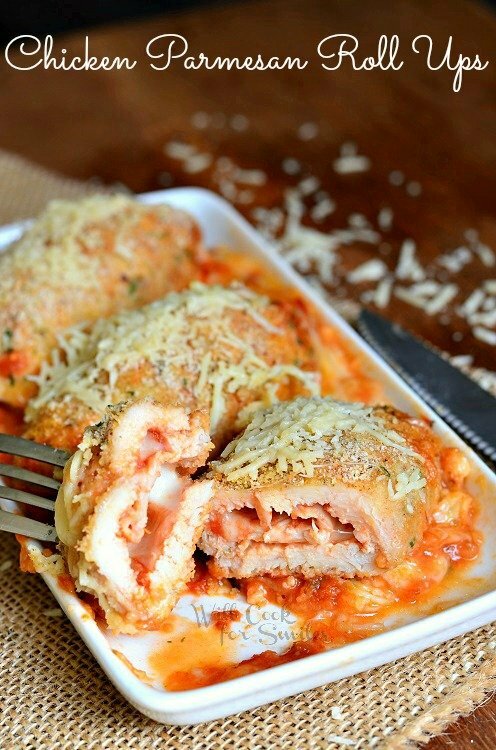 You can also play around with cheeses that go into the sauce. You can make this into gourmet date night and serve it with roasted potatoes, asparagus and use Gouda cheese in the sauce. Or, you can make it a fun family night and use white cheddar in sauce and serve chicken with green beans and tater tots! 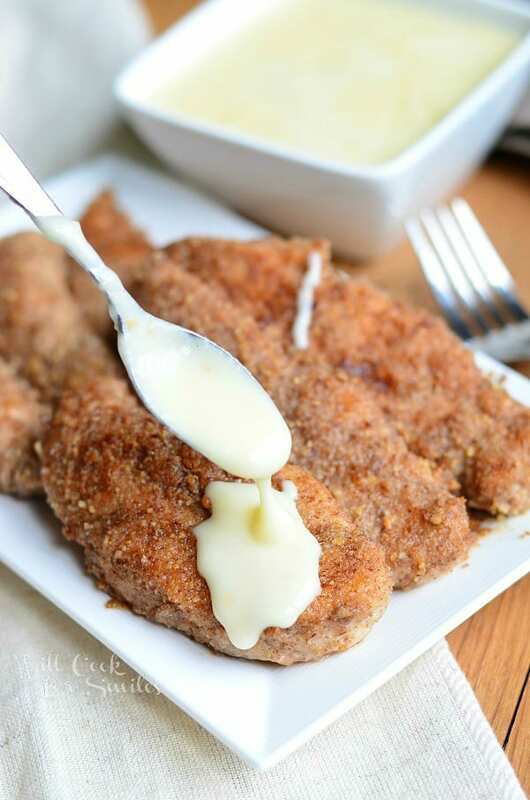 Amazing chicken tenders crusted with pecan crumbs, cooked to a crispy perfection and topped with smooth cheese sauce! Pulse pecans in a blender (or food processor) until crushed into fine crumbs. In a shallow, wide bowl, combine pecan crumbs, flour, salt and pepper. Mix well. Preheat a cooking pan over medium heat and add oil. Coat chicken tenders generously in the pecan crumbs, patting them down while coating so the crumbs stick on nicely. 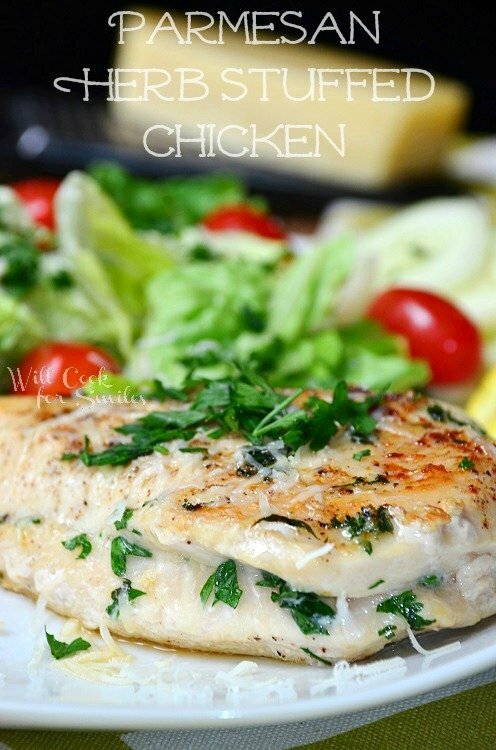 Cook chicken tenders until fully done, about 5-7 minutes on each side. In a small sauce pot, over medium heat, whisk together oil and flour. Once it starts to heat up, slowly pour in milk, while whisking. When milk starts to simmer, add freshly grated cheese and stir until all the cheese is melted and sauce is smooth. Once chicken and sauce are done, serve with your favorite side and top tenders of with some sauce! Thank you – looks delicious. 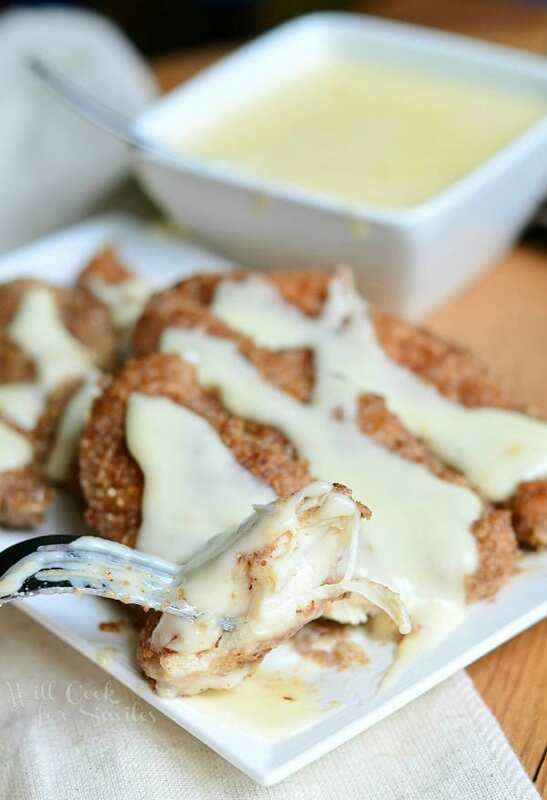 Anything smothered in cheese sauce has to be amazing, right?! And loving the pecan crust. Yum!